Break into Commercial Roofing with Our Free Guidebook! Commercial roofing can offer some strong money-making potential. If you do it right, the income-building potential is huge! You can see the potential in the numbers alone: in just 2016, commercial roofing sales in the U.S. are estimated to total $7 billion. Broken up among individuals, that’s $1 million each for up to 7,000 contractors. But, what exactly should you do to tap into that growth? And how do you even break into this highly profitable industry in the first place? 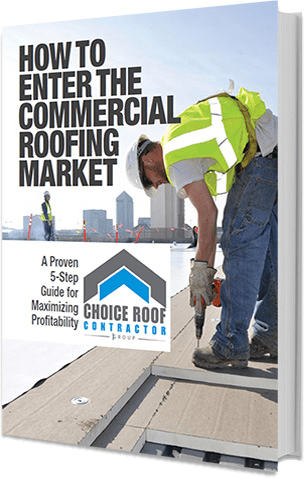 For those who are looking for answers and are more-than-ready to put that knowledge into action, we offer a compelling resource: an in-depth commercial roofing publication that combines the experience and input from our most successful contractors. eBook version is emailed quickly. eBook version is emailed immediately. If you’re tired of waiting on the sidelines or looking for the opportunity to do commercial roofing full-time, this resource is for you. Follow our proven strategies, and you’ll see the opportunities open up like never before.